All those who do hiking or adventurous activities have an interest in trying out travel or outdoor gears. No denying to the fact that we already have our favorite camping or hiking gears, but as soon as we get to know about something new, we just jump on it. On the camp, the most important thing to carry is the backpack that can stand extreme conditions and still work fine. And this is the reason why I want everyone to take a deep look in this Condor 3 Day Assault Pack Review as it is exactly the one to suit every desire. Don’t just spend unnecessarily on a bag that can turn the fun into a nightmare. Condor outdoor products have made a mark in backpack industry due to their outstanding reputation. Condor 3 day assault pack has 7 compartments in total and all are huge enough. It has the total capacity of 50 liters or 3038 cubic inches. Made of the most durable material i.e. 1000 Denier, it is pretty robust to bear any kind of abuse thrown at it. The water resistant nylon is perfectly ruggedized for hiking, military trekking and camping trips, though affordable for anyone to buy. Available in a beautiful range of colors to suit everyone’s desire. 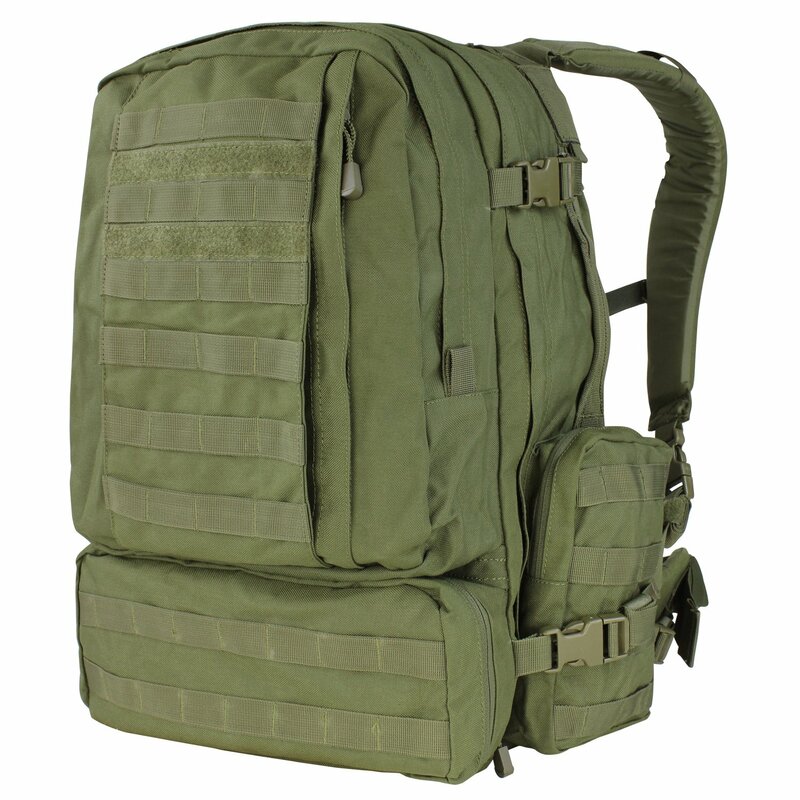 One can grab the condor 3 day assault pack in some of the exciting colors like Tan, Olive Drab, Multi-cam, Black, A-TACS FG, Kryptek Highlander, A-TACS AU and Kryptek Mandrek. It is the right thing to suit what ones need and what their purpose is!! If someone wants to buy it for hiking, then red or mandrake will work fine. Or if it’s about hunting, go discreetly with the bag choice. Again, durability is perfect here as it has been designed with double zipper pulls. Plus, all the zippers are crafted with a water-resistant technology that makes it an award-winning bag. The hydration compartment can hold two 3 liter hydration bladders that are large enough. Hydration system has Velcro pocket flaps that tightly hold the water bladder and allow the person to access it easily though the drinking tube protrudes out of the system. Side pockets add to the whole look of this amazing tactical backpack by Condors. They are capable enough to handle water bottles, binocular, monocular scope, other essential belonging, and ammunitions etc. Manufactured with the dimensions of 9 x 5 x 2.5 inches, they are wide and have double zippers. The webbing and Velcro attachments give a size increase to the bag. Many things can be hanged from outside of the bag that is a special feature of the bag. A big bag and the price is way too less than other brands. Side pockets have the perfect size i.e. not too big not too small. Shoulder straps are quite big and wide to offer comfortable carrying around. Comes with 2 heavy duty zippers. Fully adjustable bag to fit any body type nicely. Equipped with a sternum strap. Hip belt could have been designed a bit better to offer more comfort as it is not that comfortable. Q: What exactly are the dimensions of this bag? A: The exact size is not listed on Amazon, so go to the Condors website to get an idea about the accurate dimensions. 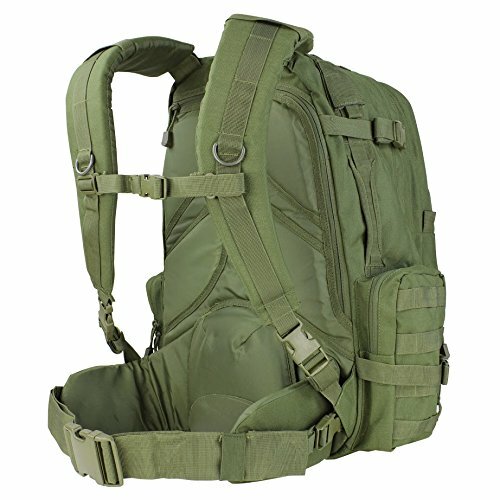 Q: Is it the same model as the Fox military advanced assault backpack? A: No, it’s not the same but quite similar. The difference lies in the internal organization where Condors has the ability to carry two 3L hydration bladders, unlike Fox. Q: Where is this bag manufactured? A: It is manufactured in China. Q: What is the weight of bag? A: It weighs 6 pounds. At the end of this Condor 3 Day Assault Pack Review, I would like to say that the pros of the bag outweigh its cons. I would like to say that it is a nice bag at this unbelievable price and as far as I am concerned, it has impressed me with its benefits. In the research, people might come across the similar bags that are available at the same price but through different brands. So act wise and find the best budget backpacking pack that is perfect in every aspect i.e. price, features, designing, colors and durability, of course.